When to get a mammogram screening? Beginning at age 40? 50? Every year or every other year? Recommendations over the past few years have been varied depending on which medical organization you look at. Now two new studies suggest that women who are at increased risk for breast cancer will benefit from mammogram screenings every other year starting at age 40. In 2009, the United States Preventative Services Task Force (USPSTF) recommended that women ages 50 to 74 get routine mammogram screenings every two years. The USPSTF recommended "against routine screening mammography in women aged 40 to 49 years," after reviewing existing research and looking at the evidence of the benefits and harms from younger women getting these breast exams on a routine basis. The USPSTF reasoned that the "additional benefit gained by starting screening at age 40 years rather than at age 50 years is small, and that moderate harms from screening remain at any age,"which led to their recommendation. Women ages 40 to 49 were advised to weigh risk factors, screening benefits and harms based upon personal information, according to the task force. Despite the USPSTF recommendation, many medical organizations, including the American Cancer Society, the American College of Gynecologists, and the Radiological Society of North America, have continued to or changed their guidelines to recommend that women have annual mammograms beginning at age 40. The two studies published Monday in the Annals of Internal Medicine lay out the risks and benefits for earlier screenings, including how often they should take place. One study finds that screening women in their 40's who face twice the risk for breast cancer has the same benefits as screening normal risk women aged 50 to 74. A second study compared annual and biennial screenings for women ages 40 to 49, who face twice the risk for breast cancer, recommending two-year intervals for screenings. Brawley explained that the benefits of mammogram screenings include decreased death rates in the U.S., especially among younger women. 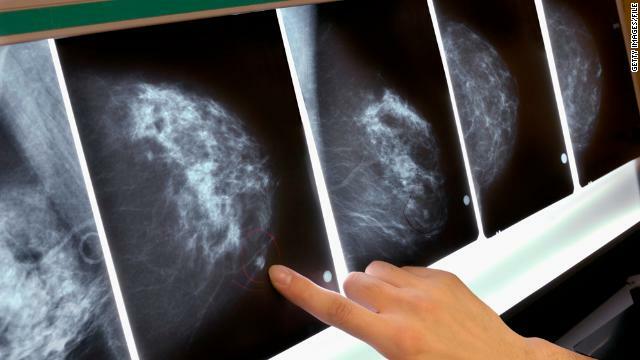 But he also noted the potential downsides of mammograms, including false positive tests, false positive biopsies, false negative tests, and radiation exposure. The findings of these two studies will add to the body of knowledge about risk and benefits of annual versus biennial mammograms, and will allow doctors to make more accurate and personalized screening recommendations for women, based upon their individual risk factors. My mother had her mastectomy at the age of 41. She waited too long, out of simple ignorance. The doctor said her lump was the size of a grapefruit. The cancer had spread to 5 lymph nodes. After radiation, followed by chemo, she was ok between the recurrences, which came every 2 yrs or so. She died just about 3 weeks after her 49th birthday. I was the oldest, at 19. My sister was 15, my little brother, only 8. I've been getting mammograms every few years ever since. Yes, sometimes the films are cloudy + need to be taken again, but so what? I have cysts sometimes, too. I always opt for (needle) biopsies. Its no big deal. I'm glad its always been benign, so far. Nobody, but nobody, can stop me from knowing what's right for my body. They can shove their recommendations. I am the only one who takes care of me, ultimately. If you feel a lump, at any age, do not hesitate to follow your gut. Have it examined! Don't be swayed by this very, very general recommendation. You do what's right for you. And, if one doctor dismisses you, find another. Its your life we're talking about here. Be brave. Catch it early. Don't worry about being wrong. Better to be wrong + alive. High risk women may benefit form mammograms starting at age 40 . Great that you are willing to share your experience RillyKewl. And you're so right, it's better to be wrong and alive than the alternative. Those looking to support a worthwhile cancer charity should check out http://www.fashionkicks.org.uk. It's a cancer charity set up by Shay Given and his wife. They do great work and could always use more patrons. Women should opt for a mammogram at the age of 40 or try to get dat done before 40. It is really shocking and sad to know that the number of women getting affected is increasing. Its better to be on the safer side. I just turned 27. I have a family history of breast cancer. My maternal grandmother carries the BRAC2 gene. My doctor noticed a lump during an annual exam and referred me(same day) to a breast imaging clinic for an ultrasound and mammogram. They declined giving me a mammogram(I have insurance and it was an emergent approval) due to my age. They did feel the lumps as I have been there twice now for ultrasounds but do not feel they are anything more than fat, which I am grateful for. But I do feel concern that with my family history and the fact there there are lumps I should have been given the mammogram. I am currently awaiting my lab work to reveal what my genetic testing is to find out if they will grant me a mammogram. Thank you for writing that Don't be swayed by this very, very general recommendation. "You do what's right for you. And, if one doctor dismisses you, find another. Its your life we're talking about here. Be brave. Catch it early. Don't worry about being wrong." I should have found another doctor immediately. I hope I don't regret the way I should have handled it.